Real Ghost Stories "Ivan Vassili The Haunted Ghost Ship"
One of the most terrifying and shocking true ghost stories in our history took place on a Russian freighter the Ivan Vassili. Now this ship was not cursed or jinxed and there was nothing unusual or spectacular about her. The freighter was built in 1897 to transport freight across the Baltic Sea to the Gulf of Finland and was driven by a single triple expansion steam engine. The ships bunkers carried enough coal to take her about 2500 miles at a speed of eight knots. It was made of riveted iron plates and her deck and superstructure was made out of wood. Now this ship was very reliable and stable and nothing unusual every happened to her for the first five years it was out on sea. Then one night everything changed, this ship became a sailor’s or anybody’s worst nightmare. 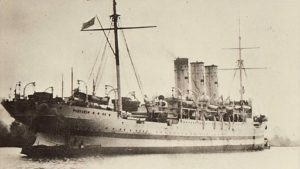 In 1903 the Russian government was preparing for war with Japan so this Russian freighters role pretty much changed overnight and the ship was ordered to carry cargo of war materials to Russian warships. So the freighter was sent to the west cost of Africa to get coal in Capetown. And after they stayed and got stocked up the crew noticed a change on the ship, something was very wrong. But everything was still business as usual and the crew set sail across the Indian ocean. Now the crew felt its as if there was an invisible entity on the ship, they felt as if something was watching them and the atmosphere just felt negative and these strange feelings went on for a while and the crew was scared. Then one night a man saw an apparition and this ghostly figure was glowing with a very odd mist and it appeared to walk normally across the deck before it disappeared behind a lifeboat. Now the eye witness told the crew and he said that it looked human but its features were hard to make out. Now this sighting only made things worse and now the crew were on full alert. Then a couple of nights later another crew member let out a horrible, terrifying scream and this sent everybody into panic and the men went crazy and they started to fight each other until one of them jumped into the ocean to his death. And After this event the crew started to cry and calm down. They had no idea what they were doing and they had no idea what was going on. Then a couple of nights later the crew just started to go crazy again and they started to fight and yet again another man jumped overboard to his death. Now the crew felt like they were being possessed and for whatever reason this entity wanted them all dead. But thankfully the crew finally reached land and they abandoned the ship. Some of them even jumped off the boat and swam once they were close enough to land, these crew members were in a stat of hysteria they were terrified beyond belief. But due to the fact that Russia was at war the Russian government rounded up all the deserters and ordered them back onto the boat. Now the Ivan Vassili was put to sea again and this time the destination was Hong Kong. And after a couple of days of rest the crew was back to normal all though they were still very terrified of this boat. Now a couple of days went by with no incidents but that didn’t last to long and yet again the crew went crazy and another crew member died. Then the next night another one died and the crew said that he died of fear. Finally the ship arrived to Hong Cong and while at port the captain committed suicide he just jumped overboard and drowned. Now the crew deserted once again and this time they were able to get away and they never set foot on the Ivan Vassili again. Now it didn’t take to long before the Russian government hired or assigned a new crew and captain to the Ivan Vassili. And this time they set off to Sydney Australia to pick up a cargo of wool. And the voyage was going great but just before they reached Sydney the captain shot himself and no one really knows why. Now there were no reports of any strange phenomena on this voyage but the crew did abandon ship making many believe that something did happen. And yet again the Russian government set out to find a new crew and captain but do to the fact that every sailor within the Russian army had heard about all the deaths and all the strange occurrences on the Ivan Vasili it took them 4 months to find the right men for the job, the ones that didn’t believe in ghost of superstition. And once everything was ready and the new crew was bordered the ship set sail to San Francisco. Now the voyage was going great for about a week and then just like clock work the crew started to go crazy and yet again fight each other. And two of these men seemed to be possessed beyond repair and the captain locked them up below deck and the next morning they were both found dead. And that night the captain shot himself in the head. The crew was no longer skeptical they believed without a shadow of a doubt that something very evil was on board and they turned the ship right around and headed back to Russia, they didn’t care what their superiors would do to them they wanted off this ship. But to their surprise the men were awarded medals and bonuses for returning the ship back to Russia. Now the Ivan Vassili sat abandon for years before the Russian government finally decided to burn it and while it was burning eye witnesses swear that they heard something evil on board screaming.